In 2009 I attend the Google Teacher Academy (Now called the Google Innovator Academy) in Boulder, Colorado. That one day changed my life. Becoming a Google Certified educator has had a greater impact on my life, career, and teaching philosophy than any other professional development experience. One of the ways that I try to give back to my profession is by helping other teachers (like you!) earn your Google Certification. Once a year I offer a free webinar to review the certification process and give away my best tips and resources to help you get Google Certified. The next free webinar is coming up! Becoming a Google Certified Educator will make you a classroom technology expert. You CAN become Google certified this summer, but you need to get started NOW! Join me on April 26 and I will explain everything you need to know. I strategically schedule this webinar in the spring because the best time to work on your certification is over the summer. This is the only Google certification webinar I am offering this year. Let me be honest, getting Google Certified isn't easy. Google has done a tremendous job in designing their certifications to actually force you to understand how to use their products in a classroom setting. You won't be able to fake your way through the process. This is an open invitation for you or any teacher you know. My goal is that by the end of the webinar you will understand the certification process and have a slew of resources to help you get started! Busy on April 26? Anyone who reserves a spot will get access to the recorded webinar which you can watch on-demand. Head over to http://gEducator.com/live to claim your spot! 1. The Three benefits of becoming a certified Google educator. Earning your Google certification is challenging. Make sure you do it for the right reasons and have realistic expectations about the benefits. 2. Which certification is right for you? Google offers 5 different certification for educators. Which one is right for you? 3. The specific steps required to achieve each certification. We'll review the requirements and steps for each certification. BONUS: attendees of the LIVE event will receive a checklist guide to help you get started. 4. How becoming a certified educator has changed the lives of REAL teachers! You'll hear from two teachers who recently completed their certifications. They'll share their best tips and recommendations to help you get started. 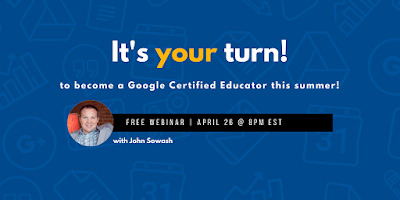 Oh, and if you are already Google Certified, please share the webinar details with a teacher who SHOULD get certified!